10 October 2018 – AMFG has today announced that it now offers a multi-platform solution for additive manufacturing, with the release of a tablet-optimised solution for post production and post-processing in addition to a new, downloadable, desktop application. As a result, AMFG’s AI-driven production automation software can now be used across all devices, providing much-needed flexibility and mobility to manufacturers. AMFG’s tablet-optimised solution is designed to be used on the production floor, giving project engineers and technicians a portable, digital way to quickly track and identify parts post production. 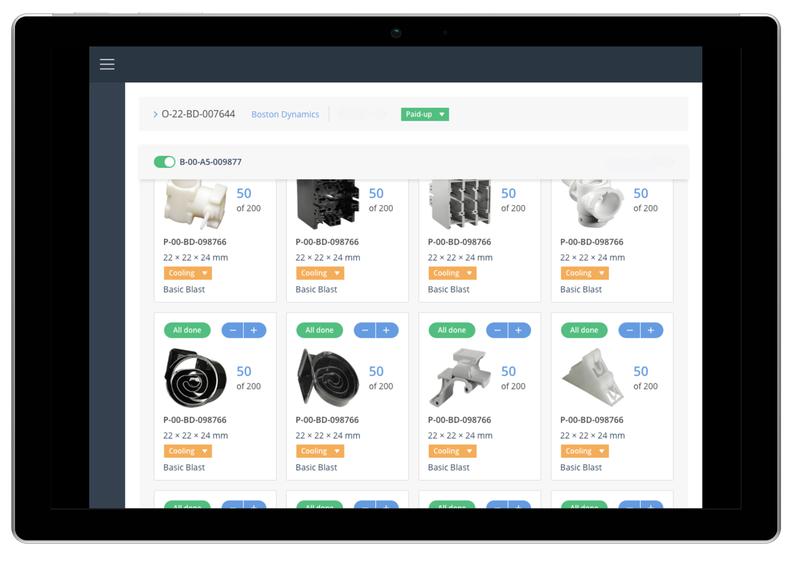 Using the system’s advanced 3D viewer, users can easily identify successful parts in real time and place any failed prints back into the system’s production queue. The 3D viewer also includes all data about the part and also logs all user activity. To ensure the quality of printed parts, AMFG’s post production solution also offers the ability to track quality assurance checks. “Manufacturers value the benefits of added mobility, which is why all of our software’s production management functionalities are optimised for tablet use,” explains Felix Doerr, Head of Business Development. “For the post production stage in particular, the real value of this is in the added efficiency. Identifying parts following production is a time-consuming, manual process, but our tablet solution completely eliminates the need to manually print out job sheets to identify parts. In addition to the tablet solutions, AMFG has also released a downloadable desktop application, giving its customers the flexibility to use the production management software directly from their desktop in addition to within their browsers.